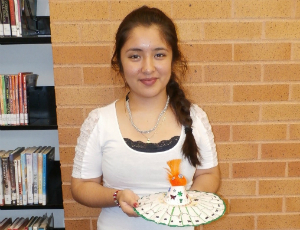 Daniela is a 16-year-old student at Benito Juarez Community Academy. This summer, she interned at Archer Heights Branch through One Summer Chicago and began helping kids create art and crafts. She also created a blog about child psychology. Q: Did you spend much time in the library before your internship this summer? A: Before I entered my internship this summer, I visited my school library more. I would go there during my lunch period and before and after school to finish any homework or help my peers. Q: Why did you decide to work here? A: I wanted the chance to work somewhere new. Before, I had done photography programs. However, as soon as I found the opportunity to work in a public library, I felt thrilled. Q: Tell us about the arts and crafts program you started this summer. A: The arts and crafts program is a program that, with the help of teen library associate Abby, I am able to do one hour every day. I usually do a different activity every day with the children. It has really brought me closer to how children think. Q: Child psychology is an ambitious topic. How did you decide to start blogging about it? A: Since I have been working a lot with children this summer, I thought focusing on children’s minds would be a fascinating project. Spending a lot of time with children every day shows me how each child is different in their own unique way. They all have beautiful ways to express themselves through art. A: After high school, I really dream of going to college. By doing so I would become the first one in my family. This would also be followed by then going to law school and hopefully one day starting a career as a politician. A: I am a student who has great aspirations for life. I look up to my mother who has raised me and my sister on her own. Regardless of the situation, she has always supported me, making her one of my biggest motivators. I also love to read, write and draw in my free time. Photography is also a big hobby of mine. I truly believe that in the end we only regret the chances we didn’t take. Every accomplishment begins with a dream. Thanks for helping us this summer and sharing your dreams Daniela!